On a Thick Whisper White Cardstock base, I added a piece of Whisper White Cardstock that was embossed with the new Lace Dynamic Textured Impressions Embossing Folder. I then layered on a large piece of All My Love Designer Series Paper, along with longer strip (notched at one end) from the same paper collection. Underneath that paper strip, I added a tiny scalloped border, created with Whisper White Cardstock and one of the Be Mine Stitched Framelits. With one of the larger hearts (from the Be Mine Stitched Framelits), I die cut a heart “frame” from the All My Love Designer Series Paper, as well as a Whisper White heart (embossed with the new Lace Dynamic Textured Impressions Embossing Folder). 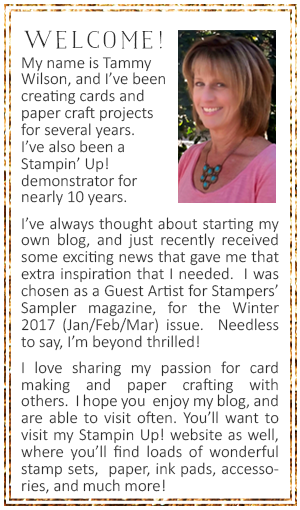 The sentiment (from the new Needlepoint—– stamp set) was heat-embossed on Crumb Cake Cardstock, using a Versamark Pad and White Stampin’ Emboss Powder, and then die cut with one of the new Rectangle Stitched Framelits, and popped it up with a few Stampin’ Dimensionals. For a bit of bling, I added some flowering vines (using some Dazzling Diamonds Glimmer Paper and one of the Be Mine Stitched Framelits), as well as a couple of the Share What You Love Artisan Pearls.